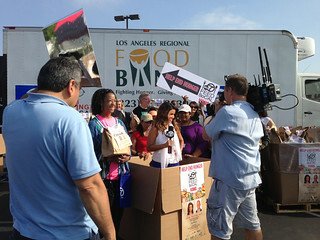 Please help spread the word for our friends at the L.A. Food Bank! ABC7 and Southern California food banks have partnered up for the 4th Annual Feed SoCal hunger initiative throughout Southern California. The initiative takes place during the month of June and will include the following food banks: Los Angeles Regional Food Bank, Second Harvest Food Bank Orange County, Second Harvest Food Bank Inland Empire and FOOD Share Ventura County. Volunteers are needed to collect donations from Albertsons customers and “Stuff-A-Food Bank- Truck”. The Food Drive is located at the Albertsons in Gardena. The address is 1735 W. Artesia Blvd. Gardena, CA 90247. Note: This is a family friendly event! During tfficult economic times, one out of every six people in Southern California experiences food insecurity. The Los Angeles Regional Food Bank serves one million people in Los Angeles County each year, but another 700,000 people need help. Second Harvest Food Bank Orange County helps feed more than 240,000 individuals each month, while the food bank in the Inland Empire serves more than 350,000 people each month. FOOD Share Ventura County is the only regional food bank in the country that provides food year-round to more than 74,500 children, adults, seniors and families each month. If you can’t volunteer, please help spread awareness by following @LAfoodBank on twitter and liking them on facebook here.